Experience American Girl in an all-new musical, coming to a city near you! 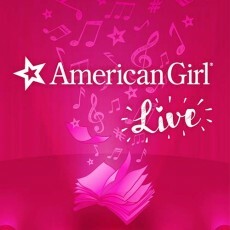 Inspired by American Girl's most iconic characters and their stories, American Girl Live is a premiere stage production, featuring all-original songs and unforgettable experiences. Come along for a fun-filled adventure, where exciting tales of bravery and friendship come to life, LIVE and in-person! Join your favorite American Girl characters, and some brand-new friends, as they follow their hearts and share their dreams, in a journey across time.